LEK GUEST HOUSE - Chiangmai. 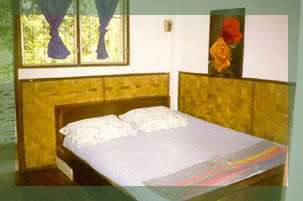 A two story motel made from teak, tucked away off a quiet Soi in a pleasant tropical lush garden setting. Lek Guest House, a two story motel made from teak, is tucked away off a quiet Soi in a pleasant tropical lush garden setting conveniently located just outside the Eastern moat of Chiangmai: 22 Chaiyapoom Road (in front of Sompet Market - 5 min. walk to Tha Pae Road and 15 min. walk to Night Bazaar). 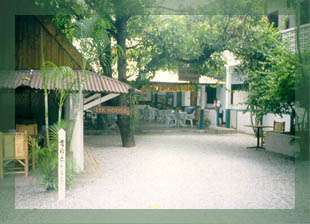 The L shaped building surrounds a lovely gated garden with lots of tables and chairs for sitting, drinking and reading under the palm trees. 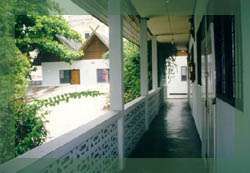 Owned and supervised by a French expatriate, Lek Guest House offers clean economical rooms with decorations that evoke images of tropical theme - wicker and the like. Lek House restaurant is famous for its Buffalo Steak dinner (a trend that Lek Guest House initiated and that is now imitated throughout Chiangmai) prepared with a tip of the hat to the proprietor's French culinary roots. A large piece of buffalo steak is grilled over charcoal with butter and served with the best French Fries (frites) in Chiangmai! The staff of young Chiangmai ladies is amongst the friendliest anywhere. DAY 1. Departure from Chiangmai 09:30 a.m. Area SouthWest of Chiangmai. By 4 x 4 truck. 3.5 hours. Stop for lunch at Akha/Shan Villages. Afternoon: Hiking 2 hours to Moe Village. STAY OVERNIGHT. DAY 2. After Breakfast, 2 hours walk to Elephant Camp. Elephant Riding 2 hours. Then visit to Karen Villages for lunch. Another 2 hours hiking to Karen Villages. STAY OVERNIGHT. DAY 3. After Breakfast, 2 hours walk down to the River. 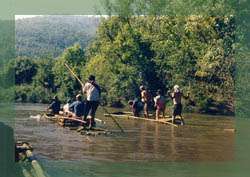 Bamboo Rafting 3 hours. Lunch at Shan Village. Then to the Waterfall by Car. Bathing/relaxing 1 hour. Continuation to the Top of Doi Inthanon. Panoramic views and visit of the Pagodas. Come back to Chiangmai by 4 x 4 truck. 3 hours. 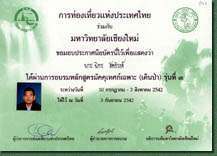 Including: TAT licensed English speaking guide, transfers, lunchs(3) , dinners (2), breakfasts (2), Elephant riding, Bamboo rafting, accommodation two nights. You can book your room right now, online! Just fill in the forms below and click!... within two business days, we'll send you an e-mail to confirm your reservation. No pre-payment needed! You can book your trek right now, online! Just fill in the forms below and click!... within two business days, we'll send you an e-mail to confirm your reservation. No pre-payment needed!